I know it has been a long time since I have had anything to blog about. Finally I finished a project in time for the appropriate holiday. 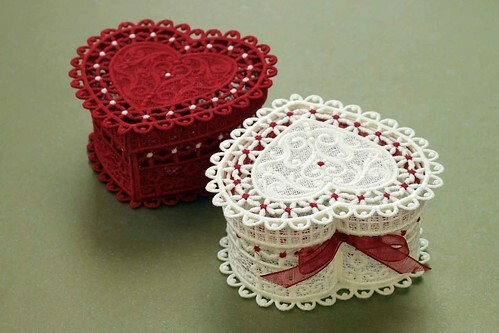 These little boxes are from a free pattern at Stitch Delight . Scroll down the page a bit and the link is on the right hand side. To be truthful, I did alter the pattern a bit to get everything to stitch out the way I wanted. I thought the sides needed more stability, so added a few of rows of under stitching. Also I adjusted the sizing slightly to get the pieces to fit together better. It was a learning experience since I haven’t done as much machine embroidery as I wish. Hopefully I can have time soon to learn more about it. I am sorry I do not post comments on everyones blogs anymore. I do read your updates. I am still working on learning new habits. When I am online I still have a terrible time getting off. Right now I control it by not getting on unless I have something I have to do like pay a bill. It takes such a long time to develop new habits. 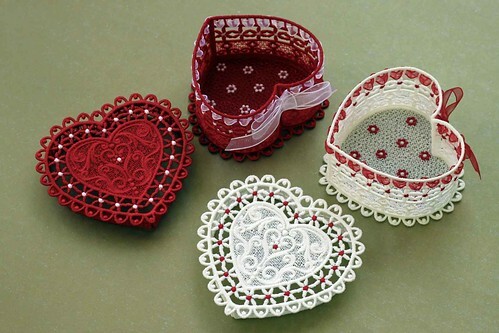 This entry was posted on Monday, February 13th, 2012 at 8:02 pm and is filed under Craft, Lace, machine embroidery and Sewing. Tagged: Craft, Embroidery, Lace, Sewing, Thread. You can feed this entry. You can leave a response, or trackback from your own site. Wonderful to see your new post & those boxes are exquisite! You did such beautiful work on them. Take care & will look forward to when you do post – it will be a treat! Love the boxes. Understand the posting and learning new habits too! Hope to see you soon. The boxes are so sweet. Very happy to see your posting!